Are Non-Stick Pans Safe to Cook with? Unless you’re in a professional kitchen where a non-stick pan doesn’t have a chance of survival then there’s a pretty good chance that you have at least one Teflon™ or non-stick pan in your cupboard. Just as we revisited the plastics in our drawers and the cans in our pantries, it’s time to look at our cookware, too. The Teflon™ website it states that Teflon™ is "non-toxic." Perhaps sitting on the shelf or hanging from a potrack it is, but according to myriad other studies, once heated, Teflon emits some pretty toxic fumes. You know how they used to have a canary in the coal mines to let the miners know if the air was safe to breathe? Well, most of us don’t have canaries in the kitchen, but the San Antonio zoo lost 21 birds who were kept warm with a Teflon-coated heat lamp. It’s true that birds are more sensitive to air-borne pollutants, but something tells me that if it can kill a bird, maybe we shouldn't be using it to cook our food. Teflon is made with Perfluorooctanoic acid (PFOA) or C8 which breaks down at high temperatures -- and perhaps at lower temperatures than once thought. In 2005, DuPont, the makers of Teflon, had to pay a $10.25 million settlement to the Environmental Protection Agency for withholding health risk information about PFOA. In 2006, the company agreed to phase out PFOA by 2015. 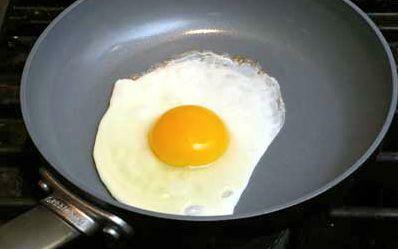 In the meantime, there has been a bunch of new “green” pan alternatives to Teflon™ popping up on the market. From Martha Stewart’s Green Pans to Cuisinart’s Greenware, Starfrit’s Eco friendly cookware, and GreenPans™. The new coating used is Thermolon, which is a mineral coating derived from silica (yes that’s sand). It has been tested in 10 countries and is certified to be safe. From my experience with green pans (I have the Martha Stewart pans and a few of the Greenpans™) they work pretty well. The pans and coating itself seem more durable than the Teflon™ coating and as long as you clean them right away they are easy to keep clean. I have had some trouble getting egg off, as it just seems to stick more on these new pans. When it comes down to it, though, I prefer to use my heavy cast iron pans with a nice coating of oil, because even Thermolon may have some unknowns still to be discovered. At least with cast iron you know what you’re working with. Leah Klein, a resident of Cambridge, Massachusetts, is originally from Canadian Mennonite territory in Ontario. With weekly Saturday morning visits to the Mennonite farmers market, she had early access to artisanal cheese, home-made summer sausages, and hearty German-style bread. She's also lived in France, England, Montreal and New York, each place, she says, adding to her culinary experiences. She enjoys cooking and spending the growing season with her family working and "sampling" at their organic CSA. Her last post for Simple, Good and Tasty was BPA: Not Yet Banned, Instead It's Canned.